Galician and German preacher and scholar; born at Podhaice in the early part of the eighteenth century; died at Frankfort-on-the-Oder Dec. 20, 1791. He was of the same family as Solomon Luria and Moses Isserles, who traced their genealogy to Rashi. 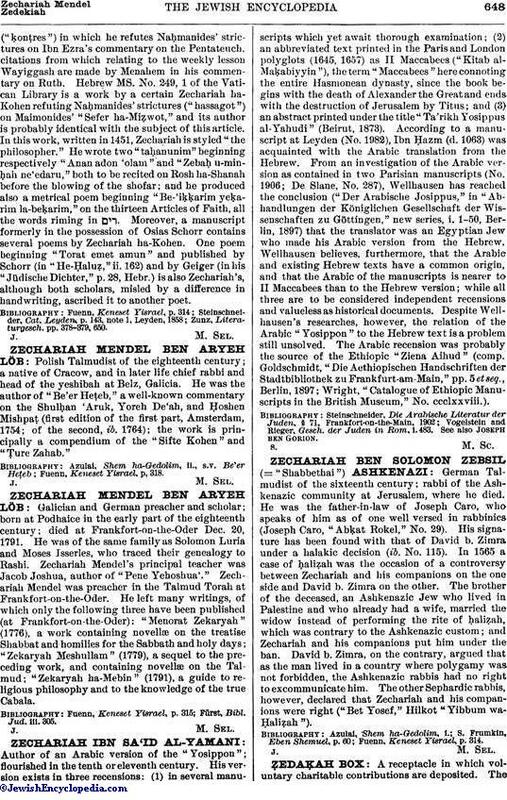 Zechariah Mendel's principal teacher was Jacob Joshua, author of "Pene Yehoshua'." Zechariah Mendel was preacher in the Talmud Torah at Frankfort-on-the-Oder. He left many writings, of which only the following three have been published (at Frankfort-on-the-Oder): "Menorat Zekaryah" (1776), a work containing novellæ on the treatise Shabbat and homilies for the Sabbath and holy days; "Zekaryah Meshullam" (1779), a sequel to the preceding work, and containing novellæ on the Talmud; "Zekaryah ha-Mebin" (1791), a guide to religious philosophy and to the knowledge of the true Cabala. Fürst, Bibl. Jud. iii. 305.